Today, I have a very unique interview with Melissa Tonini of fleamarketflipper.com about making money by flipping thrift store items. Melissa started this as a side hustle and now she does this full-time. She and her husband have made over $130,000 last year flipping items from thrift stores. She has a FREE Webinar Workshop on how to start your own flipping business where she talks about how to find items, how to sell on Facebook,eBay etc. The course has tons of info on every aspect of flipping. I never knew there is so much potential in flipping flea market items. This can be a great side hustle or even your main business. A profitable way to make money from home flexibly! Check out her interview to find out more about this side hustle. Please tell me about your background and how you started in flipping business for extra income. I learned about flipping flea market items from my husband. He has been doing it since he was 16! He started by buying Nordic Tracks for $10-$15 here in Florida and selling them on eBay to someone up north (where they exercise more) for around $200. I guess you can say I married into it. If you asked me ten years ago if I thought we would be doing this to support our young family of 5, I would have laughed. Not because I didn’t know that it could make us money, but because it wasn’t a ‘real job’. It turns out we don’t do ‘real jobs’ very well, and much prefer to work for ourselves, on our own time. What is Flipping? Can you tell us in detail? Flipping is the art of finding things that nobody else sees value in and selling for a profit! It is buying a used and second-hand item from the flea market (or yard sale, thrift store or auction), and then reselling it to someone else who is looking to buy that item. Some items require a little love and elbow grease to get looking good or functioning well again, and some items just need to be marketed online to find the person who is looking for it. An excellent reference is American Pickers. They pick and they flip five. The guys of storage wars do it too. They buy storage units full of stuff, and then sell it off in hopes to make a profit. We have never purchased a storage unit, but we buy from vendors that do. How much money can you make with flipping? This is like anything else; you get out of it what you put into it. If someone takes the time to learn some proper techniques and adopts a little time finding and posting some good items, you can make a full-time living off of it. This is something we have been doing on the side for our whole marriage. Some months it brought us a lot of extra cash, and some months not as much. We didn’t really keep good records of what we made until about three years ago. Part time in 2014 and 2015, we made just over $40K for each year! Last year was crazy, we jumped into flipping full time in May, and totaled over $133,000 for the year! We were ecstatic when we totaled the numbers and felt so blessed from last year. I love this question because it is really a lot less than people think. We recommend to our students starting out to invest $20-$50 at first. They can buy a few items for that, get a feel for what they need to do to sell them, and make about $100-$300 on it. Then take that money, reinvest part of it and do it again to make some more. We also recently wrote an eBook on how to get FREE items to sell for a profit. Rob gives 5 different ways you can invest nothing and still make a return on it. We use several of these practices weekly. What is the best part about selling on eBay? We sell on eBay, Offer Up, Facebook, & Craigslist, but eBay is our favorite because it reaches the broadest audience. The likelihood of someone seeing it who needs it is a lot higher. We can also make the most money on eBay because things tend to be priced higher than the local selling pages and apps. 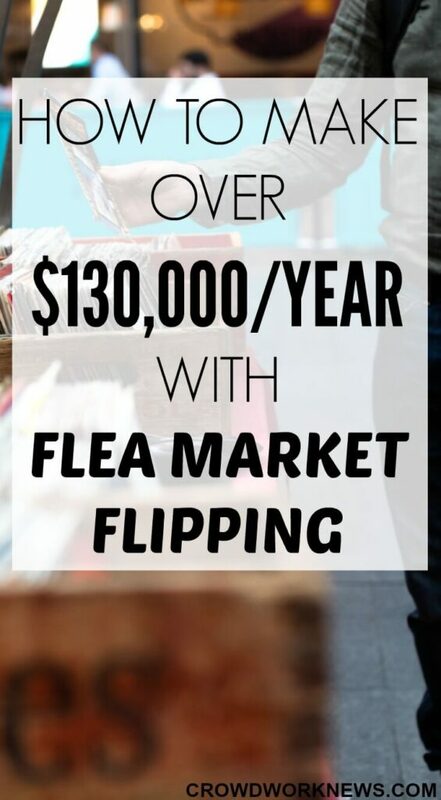 What are your tips for someone who wants to start their flipping business? If someone is brand new, we ask them to start out with items they enjoy looking for or know about. For example, my sister-in-law loves anything with sewing and crafting, so she is always on the look out for good name sewing machines, and crafting supplies, she knows that can be expensive. Another example is a mum selling baby and kid items. They are in that stage of like so they know what brands will sell the best typically. Another tip I would give is to stay consistent with it for a couple months. Visit the flea market, thrift stores and yard sales each week and keep posting the items online. Sometimes it takes a few weeks for an item to sell, so if you have a constant flow of items in and out, you will have a steady flow of money. Can you please tell us about your course? We are euphoric to be helping people make an extra income from home, in their own time, and doing something they enjoy! You can check out Melissa’s Flipper University course to get more details about this 6 figure side business. For the returns it gives, flipping is a great work-at-home option. Thanks, I am glad you found it helpful. This article sounds exactlly like my story. My husband was picking at age 6. He taught me and we taught our kids. I am so grateful that we have been able to succeed. Glad you liked the post! Flipping flea market items is really a unique way to earn money reselling cheap things.